I am always thankful for the most beautiful sunsets we have here, east of Málaga. They always seem particularly spectacular at this time of year, too. Doesn’t this one look pretty, reflected in the swimming pool? As Oprah Winfrey once said, “Be thankful for what you have; you’ll end up having more. If you like photo challenges, you might like to look at these ….. This entry was tagged Andalucía, CBBH Photo Challenge, East of Malaga, Europe, Malaga, photography, Spain, travel, Travel theme, Weekly Photo challenge. Bookmark the permalink. What a stunning photograph! Thanks for sharing! Beautiful sunset pix and a great quote in spite of the fact that I’m not a super Oprah fan, this was very cool. Incredible image!! So so beautiful! I love sunrises and sunsets – what a gift! AAwwwww are you? Then I am even more glad to share a little piece of my Paradise with you. We are so lucky living where we do, aren’t we Serena? Yes, the Law of Attraction is a wonderful thing, isn’t it, Richard? I’ve been AWOL in the blogging world and am spending some time catching up on my favourite blogs. The photograph and the sentiment are both beautiful. I couldn’t agree more. I’ve missed seeing you around, Sally – TRW always comes first, of course. Hope you can find some comfort and joy through the words and photograph. What a breathtaking photo! Nicely done. Glad you liked it, Katie. Nice of you to take the trouble to let me know. Much appreciated. Simple and exquisite sunset and thankfulness post. Thanks Ella Dee. Sure beats the thunder and rain in Sydney this afternoon! It was such a beautiful sunset Livvy, I just had to share it. Thanks for all the shares, Marianne. Just love to be sat there with a Margarita! Hang on – I’ll pour you one! Wonderful shot and great two in one challenge choice ! Thanks for viewing and taking the trouble to comment. Much appreciated. I can never resist a good sunset. 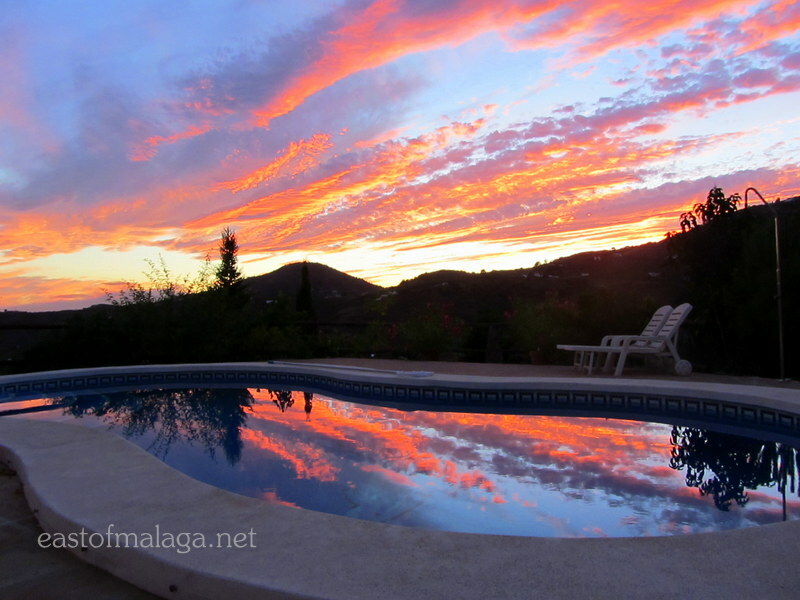 Beautiful -I do miss the amazing sunsets in Andalucia at this time of year! But you’ll be back in a while, won’t you, Tanya? It sure did! Yes, give it a try. Believe me – I am (especially on very hot summer evenings before I jump into bed)! That sky is ablaze. Nice capture. I really appreciate your comment – the sky really looked like it was on fire. Your skies could give the Arizona desert skies a run for their money. I love that quote, and firmly believe it. The law of attraction. Though it’s hard sometimes. I think you’re right Linda – there are some lovely sunsets on the Fylde coast but I think we appreciate and savour them more nowadays. Stunning sunset and great quote. Thank YOU. Glad you liked it Lizzie – you’re welcome. Lovely to hear from you, Christine.